A team of Dutch engineers just published the details of a curious new invention: tiny robotic sperm that can be controlled with a weak magnetic field. Like real sperm, these so-called MagnetoSperm flip their tails to swim towards their target. Unlike real sperm, they're made of metal-coated polymer. These little guys are pretty incredible. The simple design mimics its natural inspiration almost exactly with a head and tail, but the robo-sperm are about six times longer than real sperm. A metal layer painted on the head allows the scientists to control nanobots pretty precisely with a magnetic field. And even though the MagnetoSperm can't swim quite as fast as real sperm, scientists say they'll prove useful for microtargeted delivery of medication as well as new methods for in vitro fertilization. Funnily enough, this isn't the first time we've encountered robotic sperm. 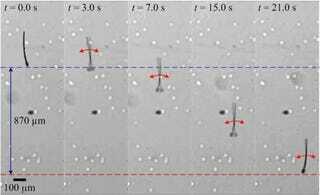 About six months ago, scientists created cyborg sperm that were actually just real sperm with a metal sheath that allowed them to be steered with magnets. The MagnetoSperm, however, are completely artificial and made in a lab. This key innovation gives engineers more flexibility. The Dutch team next wants to make the robo-sperm smaller and faster.